Pet health: Natural or organic pet food? When choosing a healthy dog food or healthy cat food, a natural dog food or organic cat food may be at the top of your list. Do you know what the difference is between natural and organic food? Is one better than the other? Knowing the true definition of these terms can help you make an informed decision about your pet’s food and in turn, maintain pet health. According to the Association of American Feed Control Officials (AAFCO), who establishes the rules and regulations of animal feed, “natural” is a food or ingredient that is derived only from plant, animal, or mined sources. It must be in either an unprocessed state or have been processed in a way that is listed in the AAFCO guidelines. Every ingredient must meet the definition of natural. Ingredients that do not have to meet the definition include: synthesized minerals, trace nutrients, and vitamins. 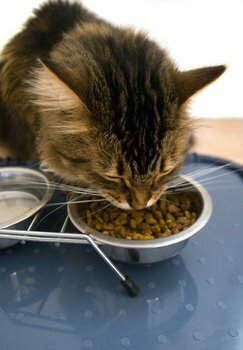 When choosing an organic cat food or dog food, be sure to check that each ingredient is listed as organic. Companies may have organics in their name but their food is not made from actual organic ingredients. Foods that have organic ingredients will have an organic certification seal on the bag. The terms “holistic” and “human grade” are not recognized by the AAFCO and therefore, are meaningless when used to label pet food.